James Stuart Park (1862-1933) spent much of his career painting flowers and it is for these works that he is best known. His early flower paintings of the late 1880s are regarded as works of brilliance in terms of their design and use of colour. Park's focus on design and decorative qualities in his paintings of the late 19th century lead to the emergence of an abstract element in his work. Whilst in earlier works the vases and surfaces which supported his flower arrangements played an important part in the compositions, in works such as this they are no longer seen. Only the bright colours of the petals emerge out of the dark background. James Stuart Park was born on the 29th of April, 1862 in Kidderminster, Worcestershire. It is likely that his father worked in the carpet industry in Kidderminster, having moved from Catrine. His mother was originally from Craigie. When still quite young he returned with his family to the West of Scotland, where his father is later recorded as a carpet designer. Around the mid-1880's Park attended evening classes at the Glasgow School of Art and first exhibited at the Glasgow Institute in 1883. It is thought at this time he was apprenticed to be an engineer, however his talent for painting developed and with further studies in Paris and Glasgow he gave up all notion of any other profession. For almost the next three years from 1889 he was to develop a style of painting which was original in its approach and which did much to enhance his reputation in Glasgow at that time. This attention resulted in a series of early flower studies which had a quality and freshness which set a basis for all his future work, for, although he painted a number of portraits, it is his flower paintings which preoccupied his output and led to his inclusion to a group of painters who came to be known as the Glasgow School and his involvement did much to further his career. Known collectively as 'The Glasgow Boys', there would be times when many of these friends would travel together painting and exchanging ideas. During this time Park had a studio in Glasgow and exhibited widely. By the late 1890's he had settled his home in Kilmarnock and in 1902 he married Helen Fullarton, a girl from Saltcoats. His address is given as 15 South Hamilton Street. He continued to develop his style while his paintings enjoyed a great deal of popularity. To meet the demand for his work he had the use of an outbuilding at Bellfield House, Kilmarnock, which he used as a studio and which gave access to the greenhouses that served this local estate. The arrangement providing an abundance of subject material for him to work from. He later rented a flat on London Road, Kilmarnock, and later bought the half villa 'Elmslie', also on London Road. There were five children, two boys, John and Charlie and three girls, Mary, Helen and Irene and there continues to be a family connection with Kilmarnock up until the present. He is still remembered, towards the end of his life, travelling about Kilmarnock by bicycle with canvases strapped to his back. An article in the Scots Pictorial of June 1900 refers to the fact that he was a splendid rider and that in the summer of 1899 he travelled from Glasgow to London by bicycle, in three days. 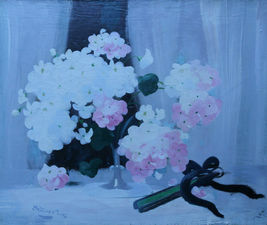 He continued to exhibit regularly having an annual exhibition every February in the McLellan Galleries, Glasgow.